When working with students, many times on their first visit to my office, they remark about how relaxing it seems. The colorful prints, inspirational wall words, plaques with favorite sayings, bubbling fountain and the hint of aromatherapy are a calculated effort on my part to not only relax the students, but myself. I also use some of these items as therapy aids when appropriate. One of my favorite pieces is a unique wire sculpture that I found years ago at a flower show. 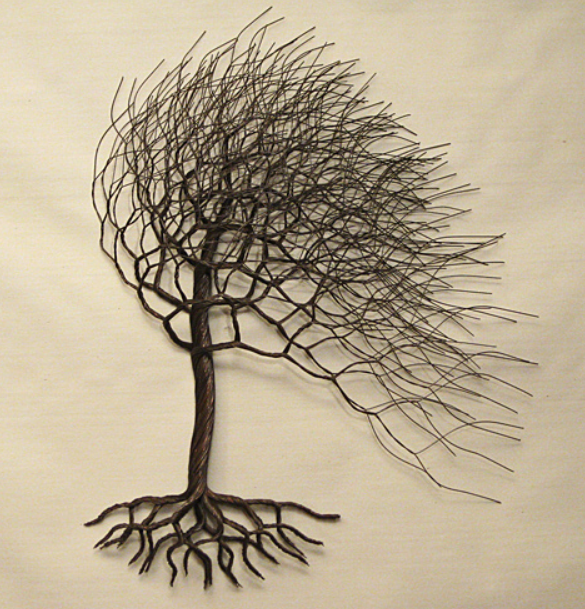 It is a windblown tree made of twisted wire in a sienna brown finish. Its solid roots are thick and gnarled, leading into a sturdy trunk, filled with branches that are leaning in one direction, as if buffeted by a strong wind. To me, that sculpture is indeed the “tree of life” we hear so much about in philosophical readings. The image represents the triumph of the human spirit that I see so often when working with clients in the often difficult therapeutic process. The roots are our foundation – our family background, our experiences, our heritage – the basis of who we are and where we come from. The trunk is our self, determined, always reaching up toward the light as we continue to grow, to heal, to seek. The branches are our life journey, each twist and turn a major decision, whether good or not-so-good, that takes us off in another direction. Some branches are shorter than others, some more twisted, some joining or grafting together to lend strength, others growing in a convoluted route that seems impossible to follow, without a clear beginning or defined end. It sounds like life, doesn’t it? Whenever I offer my interpretation of its symbolism, people usually groan when I mention the branches being a map of their decisions. They’re probably remembering the ones that still loom as regrets; the ones, in hindsight, they wish they’d never made at all. But without those questionable decisions, our tree wouldn’t be as full, as beautiful or as complete. That fullness affords us with hard-earned wisdom that we can pass on to others in need. That fullness gives us the power and stamina needed to withstand what ever life hands us – the gale force winds, the torrential rains, the searing sunshine and drought, the changing of the seasons. Yet that same fullness is flexible enough to lean with the forces of nature, yet not be uprooted. Each season brings its own joy. Spring, with its beautiful blossoms that burst forth from tiny buds. Summer, with its sunshine and warmth. Autumn, with its colorful palette of bronze and gold, orange and scarlet. Winter, with the gentle touch of drifting snowflakes and a veneer of ice that glimmers like diamonds when brushed by the sun, its starkness a beautiful simplicity. At any one time, the same tree might provide beauty, shade, food, heat, light, exercise, furniture. A nesting place, a perch, a house, a climb, a landmark, a place to lean on or hide. A groundedness, a permanence, a sense of time passing and history. A quiet purpose, a meaning, a truth. We can count on the tree, just like we can count on ourselves. 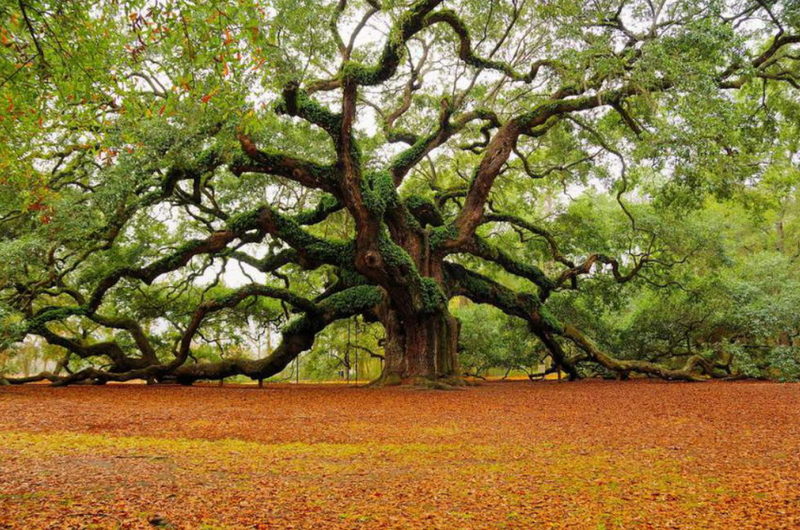 We are the tree, still standing, still growing, still providing, still seeking. We are beautiful, we are natural, we are a gift.